At about four and a half months chickens, you’re probably anxiously awaiting the fruits of your labor wholesome eggs. Now is the time to introduce your laying pullets to Purina® Layena® Sunfresh® Recipe or Purina® Layena® Recipe Plus Omega-3 to insure that they receive the best nutrition to support egg production. 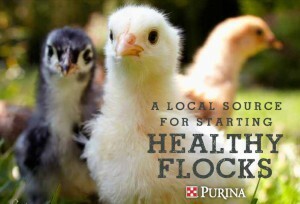 Purina® Layena® Recipe Plus Omega-3 has added flaxseed, which helps your chickens to produce with enhanced levels of Omega-3. Each egg will contain 300 percent more Omega-3, an essential fatty acid. Gradually transition your laying pullets over to Purina® Layena® Recipe or Purina® Layena® Recipe Plus Omega-3 over a 7- to 10-day period. Continue to provide birds with a maximum of 17 to 18 hours of light per day to ensure optimum egg production. Purina® Layena® Recipe Plus Omega-3 can be purchased as a pellet; Purina® Layena® Sunfresh® Recipe can be purchased as a pellet or crumble. Both forms contain high-quality grains with added vitamins and minerals for a complete and balanced diet. In pelleted form, it is just that, a pellet. Crumbles are simply pellets that are broken apart into smaller bits, which make it easier to eat. Optimum egg production is achieved when layers are maintained in temperatures between 65°F and 85°F. As temperatures increase above this, egg size and production may decrease. Keep your birds cool and comfortable so you will get the best return on your investment. Visit Argyle Feed Store for all your chicken feeds and supplies. This entry was posted on Friday, June 15th, 2018 at 4:13 pm	and is filed under Chicken Chat, News & Updates. You can follow any responses to this entry through the RSS 2.0 feed. Both comments and pings are currently closed.